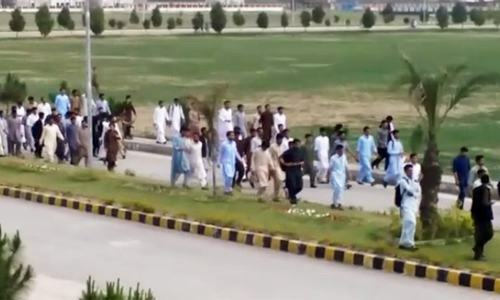 The brutal murder of the university student in Mardan raises the question of who is actually responsible. 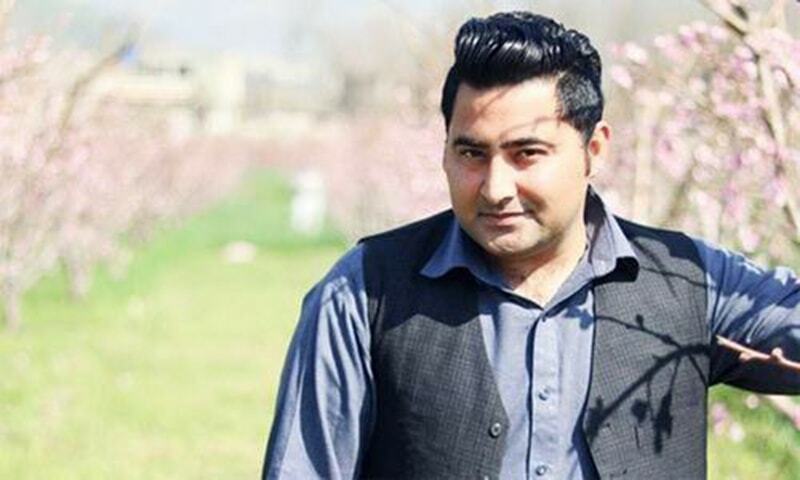 The brutal murder of Mashal Khan in the hostel of Mardan’s Abdul Wali Khan University, after being accused of unspecified blasphemy, has generated an unprecedented wave of public outrage. Despite the freedom allowed to the militant organisations to promote the cult of violence, Khyber-Pakhtunkhwa still remains considerably faithful to Bacha Khan’s legacy of non-violence and tolerance of religious diversity. 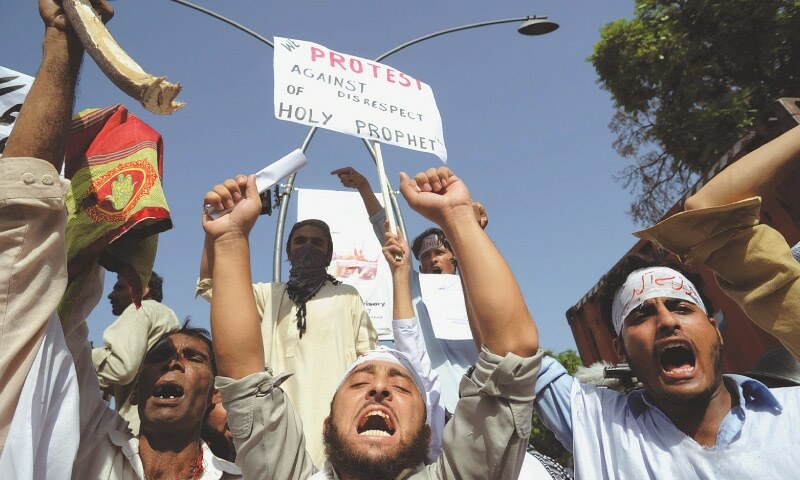 The territory is also relatively free of incidents of blasphemy. As per figures available on June 23, 2016, there was not a single Sec 295-C accused in KP jails; all six persons convicted on charges relating to religion held in prison there had been tried under Sec 295-B (desecration of the Holy Quran) and all the seven under-trials except one had also been charged under the same section. Thus, accusation of blasphemy against Mashal lacked credibility. Further, the complicity of the university teachers and security staff in the conspiracy against Mashal and the policemen’s refused to intervene when he could have been saved turned the case into one of extraordinary brutality. Hence an exceptionally strong reaction. It is also possible that the public remorse at witnessing people killed for unsubstantiated charges of offences relating to religion, or before they were convicted, and that had been building up for years, could not be borne any longer, and the community’s dormant conscience at last started turning. But what happened between the first blasphemy cases in the early 1990s and Mashal’s lynching is a sordid story of collective failure to check the abuse of Sec 295-C of the Penal Code that has been evident all along and has been callously ignored by most people. About a century ago, the ruler of the princely state of Khairpur received a complaint that one of his non-Muslim subjects had committed blasphemy. He told the man to abandon his residence and relocate himself at some other place till such time as the matter ceased to provoke the Muslim community. He chose this course apparently to avoid whetting the complainant party’s appetite for new victims and saving the non-Muslim subjects from living in a state of fear. Above all, he preferred the path of peace among his people to strife around an emotive issue. Compare this with an incident that took place in Lahore many decades later. A high court judge berated a man who appeared as a complainant in a blasphemy case and asked him why he had failed to kill the culprit himself. He obviously cleared the way not only for the institution of more blasphemy cases but also for the extra-legal killing of a number of citizens on suspicion of having committed the serious offence. The theory of blinking at murder committed with a religious motivation was consolidated. The path of peace in society was rejected in favour of a reign of violence. “If the asserted religious motivation of the appellant for the murder committed by him is to be accepted as a valid mitigating circumstance in this case, then a door shall become open for religious vigilantism which may deal a mortal blow to the rule of law in this country where divergent religious interpretations abound and tolerance stands depleted to an alarming level,” declared Justice Asif Saeed Khosa in his widely hailed judgment while dismissing Malik Mumtaz Qadri’s appeal in the Salman Taseer murder case in October 2015. But the gates of religious vigilantism had already been wide open for 25 years. And surrender to vigilantism had made the custodians of power and scales of justice blind to the fate of a series of victims. Zafar Iqbal of Lahore was put in prison for having converted to Christianity. His bail plea was rejected though no law was cited to justify his detention. He died in prison. Naimat Ahmar of Faisalabad, a teacher, was knifed to death by one of his pupils and the latter became a hero in prison. In Gujranwala, a Hafiz-i-Quran was accused by his wife of allowing the Holy Quran to fall from his hands. Nobody verified the charge. He was beaten up mercilessly by a mob and dragged through the streets till he died. And a young Christian couple was thrown in a brick kiln stove near Lahore over a wage dispute after being falsely accused of blasphemy. The people watched in silence. But more crucial was the silence of the custodians of the state’s authority for it meant condoning, if not explicit approval, of religious vigilantism. If they spoke at all, as they have been doing since the arrest of a few bloggers early this year, it was to reaffirm their resolve to deal with blasphemy with an iron hand. Maybe they wanted to pre-empt more strident calls in support of vigilantism but the effect has been just the opposite. Each warning to anyone who fell under the mischief of laws relating to religion has become an encouragement to the perpetrators of mob justice. The ulema were asked to disapprove of vigilantism. They consistently declined to do so, though some of them did reject abuse of the laws for offences relating to religion. While defending the addition of Sec 295-C to the Penal Code, the learned ulema had said that in the absence of this law it will be impossible to prevent vigilante killing of suspects. How do they explain the surge in such killings after this law was made? A question arose whether killing anyone for belief through terrorist methods amounted to terrorism. The anti-terrorism court convicted Malik Mumtaz Qadri of terrorism and murder but the Islamabad High Court deemed it proper to drop his conviction for terrorism. It was left to the Supreme Court to set aside the high court order of Qadri’s acquittal from the charge under the Anti-Terrorism Act. This is the crux of the problem. Unless murder is treated as murder, and terrorism as terrorism, regardless of the holy robes sported by the vigilante brigade, the threat of a doomsday scenario hinted at by the Supreme Court will persist. And more mothers will share the agony of Mashal’s mother when she found the fingers she kissed broken and the face she adored unrecognizable. Time to count all the hands on which Mashal’s blood can be traced. CAN A MOB BE CONTROLLED? A lack of commitment to a cause or process, inordinate delays in completing a task, cutting in line — these are typically ‘weapons’ of society’s weak and vulnerable. They are responses to the everyday violence and oppression heaped on them. Such is their lowly standing in society that they cannot respond in kind; they are forced to adopt these subversive, often small measures of resistance. In Pakistan, such responses are widespread and reflect society’s ugly dichotomies. But sometimes, the outpouring of rage goes beyond these everyday acts of resistance. Anger gets diverted on to the streets, and in some cases, at individuals who are alleged to represent the original oppressor or at property deemed to be connected with the oppressor. Contrary to popular perception, mobs are in fact an organised activity. They are not a spontaneous occurrence that has burgeoned from a sense of deprivation. Mobs are an insidious activity, carried out by a handful of orchestrators who provoke and manipulate others into acting a certain (violent) way. They use the cover of the crowd gathered around them to camouflage their identity and evade law enforcement. And once their objectives are met, it becomes doubly difficult to affix responsibility since mobs can disperse instantly as well. 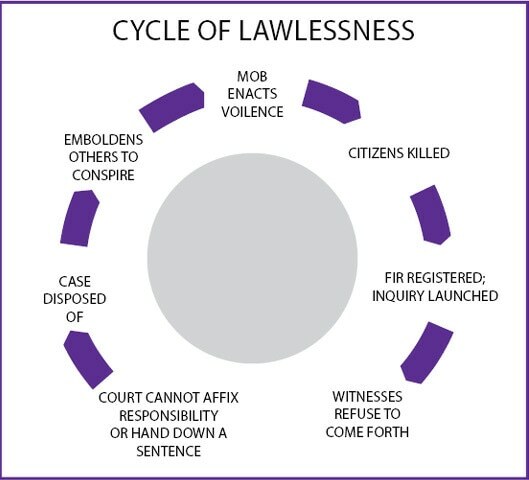 It is because of these dynamics that mob-based violence is a nuisance for law-enforcement. Can a mob even be controlled? Mobs are defined as large, disorderly crowds. There are four types of mobs: aggressive, escape, acquisitive and expressive. 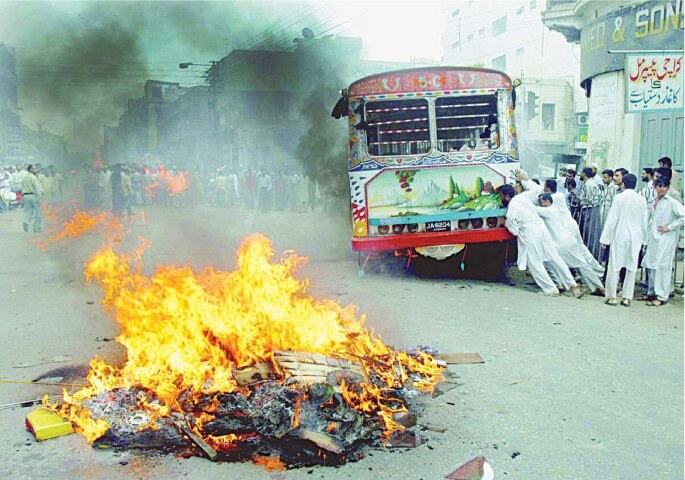 An aggressive mob is typically most common in Pakistan. These ones attack, go on rioting sprees, and terrorize citizens and law enforcement. Think of the attack on the headquarters of Pakistan Television during the sit-in staged by the Pakistan Tehreek-i-Insaf. An escape mob, on the other hand, is attempting to flee from something. These are found in situations where panic has set in and people have lost their ability to think rationally. The stampedes during Hajj are an example of this type of mob. An acquisitive mob is one that is motivated to acquire something, usually property. The London riots of 2011, where citizens went on looting sprees, are a good example of such mobs. Lynching is now considered a crime in the Anti-Terrorism Act, 1997 and is punishable by a jail term of up to three years, a fine, or both. An expressive mob is one that expresses passion following some sporting event, religious activity, or celebration. Egypt, for example, saw its goriest football-related violence this century in February 2012 during a match being played between El Masry and El Ahly at the Port Said Stadium. El Masry won the match 3-1 and its supporters invaded the pitch and other stands in the aftermath. As a result, 74 people were killed and more than 500 injured after El Masry fans attacked El Ahly fans with knives, swords, clubs, stones etc. Although the different classifications exist to help law enforcement differentiate civil unrest from panic, it is clear that there are many different motivations for what drives a mob. 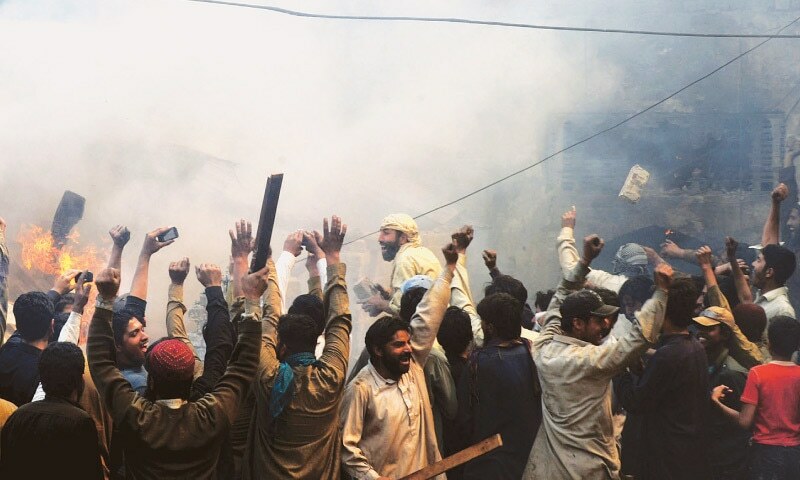 Although perceived affronts to religious sentiments draw out the mob the most in Pakistan, these are not the only types of cases that draw mob-based responses. Consider the following: a woman suspected to be a burglar was thrashed by a mob in August 2016 not because she was attempting to steal. The mob believed that she was a child kidnapper since the 10-year-old boy accompanying her did not resemble her. The child turned out to be her son. In November 2014, a mob thrashed four men believed to be robbers. The victims were actually employees of the power utility, K-Electric, and included a supervisor, three linesmen and a driver. Interestingly, in neither of the cases was anyone charged for a wrongful attack on unarmed civilians. In both cases, the police released the victims after ascertaining that they were not guilty of committing crimes that the mob accused them of. “The law is very clear on this, it provides safeguards to officers of the state to protect themselves and to protect others who might be in mortal danger,” argues former inspector general of police (IGP) of Sindh, Afzal Ali Shigri. The laws that the former IGP refers to are provisions 96-106 of the PPC (see box). In situations where a victim of mob violence is at threat of being killed, the victim retains the right to private defence. An action carried out in defence cannot be construed as an offensive act (Section 96). Per Section 97, every person has a right to defend their own body as well as the body of anybody else whose life is under threat. Shigri might have risen to the rank of Sindh IGP but he started off his career in Khyber Pakhtunkhwa (then North West Frontier Province) over two decades ago. His first posting was as an assistant superintendent of police (ASP) in Charsadda, which at the time was home to a peasant uprising against local feudal lords. were killed and at least 40 injured as the police skirmished with the peasants,” recalls the retired IGP. A judicial inquiry was lodged in the aftermath to ascertain whether it was a case of police high-handedness or if the police were actually pushed into opening fire. The inquiry report submitted that the police were not at fault. The former IGP discusses the case as an example of how the law protects the police and other law enforcement in situations where they are confronted by a mob. “Back then, senior officers as well as politicians would stand by the police as they upheld the law,” says the retired officer. Shigri argues that in most cases today, politicians will try and appease the public and turn the screw on the police in order to maintain their credibility. “It is very easy to drag a police officer down with Section 302 [which deals with murder, causing murder or the intent to commit murder],” he says. Under the new laws, if someone is levelling false charges for a crime that carries a death penalty, they can be jailed for seven years. The former senior officer lays the burden of lawlessness on law but also on various attitudes that have permeated society. “The criminal justice system has failed. There is an attitude now that the system will not protect victims nor will it punish the perpetrators,” he says. Can the mob be controlled? “Controlling mobs can be difficult as the police also have to ensure that excessive force isn’t used that results in a disproportionate loss of life,” argues Reema Omer, legal adviser for the International Commission of Jurists (ICJ) for South Asia. In fact, state brutality is among the issues that Pakistan had pledged to tackle when it signed on to the United Nations Committee Against Torture (UNCAT) back in 2008. Pakistan ratified it in 2010, which meant that it now had to comply with the United Nations Convention Against Torture and Other Cruel, Inhuman or Degrading Treatment and Punishment. At the UNCAT hearing, held on April 18 and 19, 2017, Pakistan’s position was represented by Barrister Zafarullah Khan, special assistant to the prime minister on human rights. He informed the CAT committee that a law on lynching has been passed in Pakistan to combat the menace of mob violence. The changes Barrister Zafarullah referred to are part of alterations made through the Criminal Laws (Amendment) Act, 2017 in February this year. “Our government is working on a new narrative for Pakistan, one that shuns a medieval mindset and embraces human rights,” argued the PM’s advisor at the UNCAT hearing. And yet, he also evaded the question of how a three-year penalty for murder becomes a deterrent. “Even though there is a possibility of other offences being joined to this (so for example, murder or other offences committed along with lynching), this does raise the question of why this offence was introduced and what’s the purpose?” contends Omer. Barrister Zafarullah also referred to punishments introduced against those who levy false blasphemy charges at the UNCAT hearing. If the false charge is for a crime that carries a life imprisonment term, the accuser can be jailed for five years. “But do note that despite these laws, people who bring false complaints have never been prosecuted,” argues Omer. Meanwhile, Shigri contends that with the law on their side, courts and law enforcement should turn to pictorial or video evidence as proof. “In mob matters, witnesses don’t tend to come forward,” he says, explaining that lack of testimony is not just a Pakistan-specific phenomenon but a global one. But there are solutions too: “In the London riots of 2012, courts used pictorial evidence to fix responsibility,” he recalls. But while the United Kingdom’s legal justice system is still functioning, there is a lot left to be desired when it comes to the Pakistani one. As one senior Sindh Police officer puts it, the fact that even the media are not on the same page when it comes to mob justice means that there is little motivation to repair Pakistan’s broken criminal justice system. “Narratives are constructed out of thin air,” he says. For a criminal justice system that needs to be rethought and rebooted, there is much to consider. 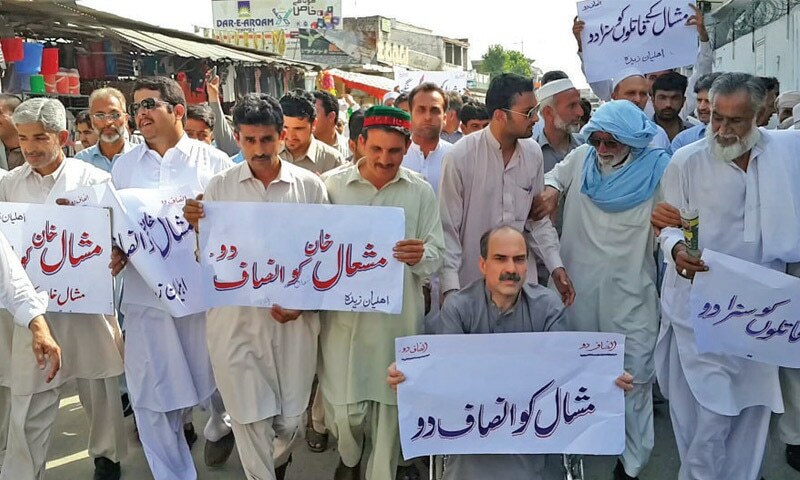 “The story of Mashal Khan’s burial [where his village stood up for him] is the message that needs to be sent out — that from now on, vigilante justice will not be acceptable,” contends Shigri. Secondly: The property, whether movable or immovable, of himself or of any other person, against any act which is an offence falling under the definition of theft, robbery, mischief or criminal trespass, or which is an attempt to commit theft, robbery, mischief or criminal trespass. There is no right of private defence against an act which does not reasonably cause the apprehension of death or of grievous hurt, if done, or attempted to be done by a public servant acting in good faith under colour, of his office, though that act may not be strictly justifiable by law. Extent to which the right may be exercised: The right of private defence in no case extends to the inflicting of more harm than it is necessary to inflict for the purpose of defence. Explanation 1 :A person is not deprived of the right of private defence against an act done, or attempted to be done, by a public servant, as such, unless he knows, or has reason to believe, that the person doing the act is such public servant. Explanation 2: A person is not deprived of the right of private defence against an act done, or attempted to be done, by the direction of a public servant, unless he knows, or has reason to believe, that the person doing the act is acting by such direction, or unless such person states the authority under which he acts, or if he has authority in writing, unless he produces such authority, if deemed. Fourthly: An assault with the intention of gratifying unnatural lust. Fifthly: An assault with the intention of kidnapping or abduction. Sixthly: An assault with the intention of wrongfully confining a person, under circumstances which may reasonably cause him to apprehend that he will be unable to have recourse to the public authorities for his release. If the offence be not of any of the descriptions enumerated in the last preceding section, the right of private defence of the body does not extend to the voluntary causing of death to the assailant, but dose extend, under the restrictions mentioned in Section 99 to the voluntary causing to the assailant of any harm other than death. Illustration: A is attacked by a mob who attempt to murder him. He cannot effectually exercise his right of private defence without firing on the mob, and he cannot fire without risk of harming young children who are mingled with the mob. A commits no offence if by so firing he harms any of the children. Will the Pakistani leadership confront the challenge laid bare by Mashal's murder? How many hands is Mashal's blood on? Without a doubt and unquestionably, all those with Mullah's ideology. All of us are complicit, as we stood by silently, watching our society become more and more intolerant with every passing day. @FAM All of are complicit because we allow such laws to exist in our legal system. University administration should be thoroughly investigated for this murder. All those who are involved must face justice equally. Simply, Mashal's blood is on all those that believe & practice this murderous ideology & also all those who are complicit. It makes me cry every time when I read it. I wonder how people might be this much brutal in their set of beliefs. @Tutu It's not because of the law, it's because of the twisted mentality that many of us have adopted. The law is there to provide justice, but the extremist bypass it and the masses keep silent. Imagine if there were no blasphemy law, then there would be no excuse left for the extremists. They would say that the law doesn't care about it, we would have to do it ourselves. As long as the brutal law is in place, this is bound to happen.....and all those who empathize never make any mention of removing the law. Man it really burns from inside. I sit all the way in the US and the unfortunate decent that Pakistan has taken is one of the major reasons I had to move. "Dastane"?? No one is hiding their hands. People take pride build mausoleums for such murderers; they come on TV and always put a "But" in their arguments. The day Pakistan has more people like justice Khosa, I do not see us coming out of this ditch any time soon. "Right to life" is a fundamental right in our constitution and it has to be protected by us without buts. @Joe If we can understand need of these eradication, lots of people are dying due to hunger but who cares. I was shocked to find 2 out of 4 educated youth, my ex-colleagues fully supporting this gruesome murder, lynching by the mob. No doubt there is a specific religious group hell bent at instilling intolerance and violence among the peace-loving majority Muslims of the world.